Theres nothing to download, no software to install. If you've got a web browser, you've got DocMonster. Organize your assets using folders or directories just like a standard operating system. Manage your users and control who has access to your files and folders. We can integrate the DocMonster login into your existing site. Your users will seamlessly access DocMonster from your website. Using our simple file browser, you can upload a single file, or entire folder to your DocMonster. By adding keyword, title and author tags, you can find what you need in seconds. 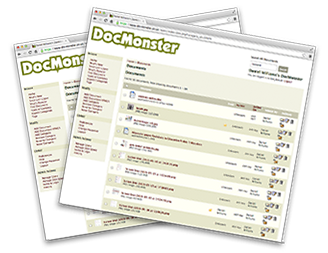 DocMonster is flexible, allowing you to upload, store and share any file format. Notify users when you make changes to a document or upload a new file by sending them an email with a link directly to your document or folder.